The year, as I recall, was 1996, and John Major’s Government was in crisis. On Channel 4 News, one of the dissident eurosceptics to whom the Prime Minister had given the amply descriptive nickname of “bastards” was solemnly reiterating the need to “repatriate” powers from Brussels. It was a grim moment for Major, and my student Schadenfreude at the Tory backbiting was tempered by a nagging fear that such ideologues might actually succeed in separating people from the common source of their daily bread and maternity pay. My landlord, a plain-speaking north-side Dubliner, had a very different reaction. Laughed because the eurosceptic, Sir Richard Body, talked funny, with an accent native to no part of England but transmitted through public school, which actually meant “private”. Laughed because of his tweedy and mismatched dress. Laughed because of his otherworldly concern with Europe and, not least, because his constituency was called Holland with Boston. Of course, being a Brit, I was well aware that Boston, Massachusetts was named after Boston, Lincolnshire. As a child on holiday in England, I had even seen the cells there in which the Pilgrim Fathers were held. All the same, I found my landlord’s response unsettling and resolved to observe him further. Later I noticed that he also laughed when newsreaders referred to “the City” — expecting, rightly as it turned out, that all those listening would know which one was meant. Fast forward 20 years, and euroscepticism may still be with us, but other things have changed mightily. With the referendum campaign in full swing, the UK establishment is taking Scots nationalism very seriously indeed, the third stage in Gandhi’s aphorismical history of independence struggles. The trouble for those on the “no” side is that so many Scots are moving in the opposite direction, meeting the objective weirdness of an unreformed Westminster with undisguised mirth. Before the advent of devolution in the 1990s, of course, the Mother of Parliaments was the only show in town, and no one would have thought to snigger at it. Moreover, politicians on both sides of the House wrote learned treatises on its virtuous quirks, its “sovereignty”. And Westminster could do scary things too, as the loss of traditional industries showed. It was clearly a heavyweight institution. But then came the Scottish Parliament. In common with the exemplary political system they had bestowed on defeated Germany at the end of the Second World War, the English proceeded to grant the devolved Celts far more sophisticated and democratic parliamentary set-ups than that which they enjoyed themselves. 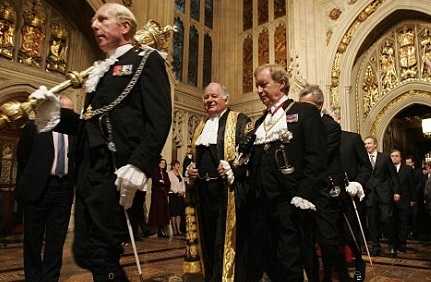 The truth is that few people would nowadays choose to establish a first-past-the-post lower house, or an upper house that retained bishops or hereditary peers, or whose non-hereditary members were simply appointed. And regardless of what party or parties were in power in the respective institutions, the Scottish Parliament has delivered better government than Westminster too. In this respect, England, and by extension the UK, is a prisoner of its own history. Its two seventeenth-century revolutions were top-down affairs. The popular eighteenth- and nineteenth-century revolutions never happened. Nor did the comprehensive military defeats that could have provided space for democratic renewal. The result of the current, nationally delimited collapse of verities has been a thoroughgoing disconnect, a situation unlikely to change unless the English do the unthinkable and, as a prelude to the reform of Westminster, start laughing at it too. That hasn’t happened yet. Although they have always been ready to laugh at themselves in the form of Morris dancing and folk song — phenomena that I have always rather admired — they have been considerably less willing to poke fun at their quaintly dysfunctional political institutions. Even satires like Have I Got News for You remain smugly ad hominem in their approach to parliamentary democracy. Meanwhile, the lack of any groundswell of support for republicanism in England may lie partly in the fact that Westminster, the obvious alternative source of legitimacy, is itself so manifestly absurd. And so it is that we have the Woolsack and Black Rod and a head of state with two birthdays. That someone making a donation of reasonable size to a political party can expect to debate our laws from the red benches of the House of Lords draped in a dead non-domesticated animal. That a man called the Chancellor of the Duchy of Lancaster can sit in the Cabinet. That a singularly effective way to increase the representation of women in that same Cabinet would be to make Eton co-educational. And so it goes — all clothes and no Emperor. Be in no doubt, however: more and more people are beginning to laugh. And, regardless of the result in September, that development is likely to continue. Not forgetting the Speaker, the Remembrancer and all the other historical oddities from custom and practice lost to the mists of time! Great article, just the right amount of humour and disrespectful bumptiousness! Especially the Remembrancer, the sole goal of which Is to ensure that any bills passed do not adversely impact London. In other words what we always suspected, London first and most, f**k the rest. Strictly speaking , the Remembrancer (that major , un-elected figure in the British un-constitution who plays such a massive role in ruling over us yet who most folk have never even heard of) is in Government in order to look after the interests of “The City of London”, rather than the interests of “London”. How can you fail to take Sir Richard Body, of the Berkshire Bodys, Baton Bearer for Betty Battenburg seriously? Oops except he’s not Black Rod! Sorry. I’d delete it if I could. Even the English are fed-up with Westminster, if my English friends and acquaintances are anything to go by. Following that I have no doubt the satire about Westminster and its occupants will grow until the English laugh at the absurdity of it all and hence change will follow on many levels.